"The Benevolent Society of Carpenters and Joiners are willing to contract with any captain that may be willing to take any number, not less than TWENTY, to Valparaiso, Sidney, or Hobart Town. Address to the secretary of the society, New Zealander, Wellington, New Zealand." To the Editor of the "New Zealand Gazette and Wellington Spectator" "Sir, - Knowing your impartiality, I trust you will not refuse insertion to the following remarks. 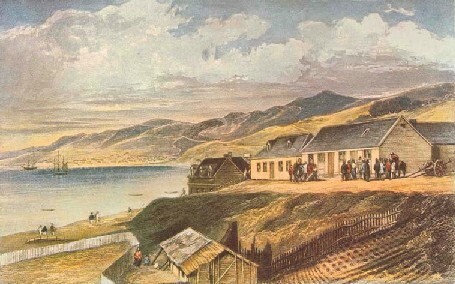 The New Zealand Company's agents at home, in inducing persons to emigrate for their settlements, guarantee the emigrants, if unable to obtain work at their own trades, employment, at the rate of £1 per week, and rations. Every one who has arrived here has come impressed with a belief in the truth of this statement. At this period work is rather slack ; and on those who left England (believing in the faith of the Company) applying to the proper persons for the fulfillment of the contract, they are placed on the road, to receive a pittance of 9s., l0s., or (some very few) 12s. per week, with what is called rations - such rations - the meat being positively gangrene ; and I am sure the hungriest cur amongst the Maori breed would turn away with disgust from it. Is this the way to treat men? Can the Company expect favourable statements to be sent home, when, instead of what is noised about in England, their emigrants only receive from 9s. to 12s. per week, which, with the price of provisions, will scarcely keep a family from starving? "We insert in today's paper a letter signed Colonist complaining of the wages paid by the Company, and of the quality of the rations they supply. The writer is under the idea that the Company are pledged, at all times, to secure the emigrants in wages equal to 30s. per week. In this, we believe, there is some mistake. To the emigrants who formed part of the expedition which first left England, some pledge of the sort, we think, was given; but we are assured that the Company now decline giving any pledge of the kind. The Company had the reputation of having the best rations in the colony; indeed, their salt provisions and biscuit were so excellent that they were in great demand among the colonists generally. We have reason for believing, however, that Colonist's complaint is not unwarranted; that, in fact, the Company's rations are not now at all to be compared with those issued in former times." As may be gathered from the foregoing extracts, the supply of labour, when we left Port Nicholson, was very much in excess of the demand. Beef, 1s 2d to 1s 4d per lb.